SAO PAULO (CNS) — Pope Francis’ nomination of Archbishop Sergio da Rocha of Brasilia as a new cardinal did not surprise anyone who knows him, except maybe the archbishop himself. The cardinal-designate has a distinctive missionary and conciliatory style, and close acquaintances say he has a keen ability to communicate with members of Brazil’s many social movements. “He is a cardinal for the times we are living today,” said Jose Geraldo de Souza, a law professor at University of Brasilia, who has served with the cardinal-designate on the Brazilian bishops’ justice and peace commission. De Souza said the cardinal-designate, president of the Brazilian bishops’ conference, has a deep commitment to evangelization and working with the poor. “A few years back, the church had distanced itself from the objective of fighting for the poor,” said the professor. “Pope Francis has brought back a church that does not stay within four walls, that goes out to meet and help its followers. 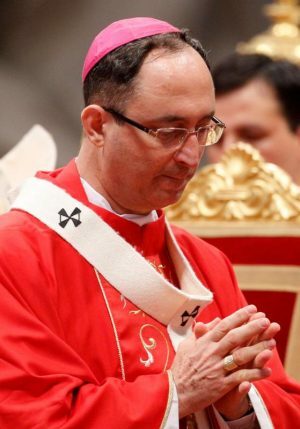 Archbishop Rocha has always followed that belief,” he said, noting the cardinal-designate’s chosen coat of arms bears the motto “Omnia in Caritate” (All things in love). De Souza said Cardinal-designate Rocha is first and foremost a mediator. “He does not isolate himself from others, he will talk to all groups and factions and he is very good at mediating different points of view,” said the professor. “He does not run away from conflict; instead, he puts himself in the middle of it and mediates so that all parts discuss the issue and find a solution,” said De Souza. During a visit to Recanto das Emas, a very poor community outside the Brasilia city limits, Cardinal-designate Rocha told reporters he was surprised by the news. “He is different from other priests and bishops that come around. He is a bishop who really cares about us, about the poor and needy in this community,” said Coelho. She said he has so many poor communities to tend to that he is only able to visit every five or six months, but when there is a serious problem involving one someone at the parish, he always comes promptly. Father Donizete de Oliveira, a childhood friend, agreed. Father Oliveira said the cardinal-designate has a unique ability to unite people from different backgrounds and viewpoints. “He knows how to say the right thing at the right time,” the priest said. Friends for more than 47 years, the two men were raised in the same small town in the interior of Sao Paulo state, went to the same elementary and high schools and ended up in the same class at the Sao Carlos Seminary. “I always knew he would one day become cardinal. (Cardinal-designate) Rocha has that special quality of dealing with people, of feeling their pain, of understanding their suffering,” said the priest. Father Oliveira said Cardinal-designate Rocha “never forgot his humble childhood” and has always shown a special preference for the poorer communities of the parishes and dioceses through which he passed. He said his friend is very similar to Pope Francis, by the way he looks after the less privileged and the way he has little need for material things. “The pope recognized these qualities in Archbishop Rocha. If one day he leaves Brasilia, he will do so with one suitcase with some clothes and a few of his favorite books; that is all he will carry with him to his next place of residence,” Father Oliveira said with a chuckle.